When you think about how much revenue a college generates annually and the source of that revenue, the trail typically ends in the office of admissions. For state supported colleges, the percentage of total revenue generated through tuition may be well over 60%. For privates, it’s often 80% or more. When I suggest that the trail of this revenue ends in the admissions office, I’m referring to the department that employs and manages the people who are responsible for generating interest among prospective students, managing the “sales” process and “closing the sale”. The aim, of course, is to match the student’s needs and preferences with the attributes of the institution: to best serve the student’s educational aspirations and personal growth. Fortunately for students, they may choose among many fine institutions that are fully capable of doing just that. In truth, academic sales and marketing is similar to that of the B2B (business to business) and B2C (business to consumer) marketplaces. That is, generate interest, prove that the institution is a good fit, and manage the communication and human interaction process toward a successful conclusion (enrollment). Here’s the $64,000 question: how much does an institution invest in the people and processes that are central to generating the vast majority of the revenue collected by the college? I’m not referring to things like direct mail and website development. I’m referring to people and processes – the hiring of the admissions team, building a motivating culture, engaging in a comprehensive training program, implementing effective sales management, providing CRM software designed to enable sales, and enhancing communication between people and departments. The answer? Not nearly enough. And why not, when the potential return on investment is so large and immediate? Every institution can find its own reasons why they aren’t investing in these areas. We’ll often explore those reasons as part of our consulting engagements with clients. The most common barrier is perceived cost. But that barrier is easily removed – at little cost – with a change in perspective. Here’s something that any institution can begin doing tomorrow that promises improved functioning and production out of the admissions department: identify the strengths of each and every member of the department, fully align their tasks with those strengths, and lead them with an understanding of how someone with their strengths is most productive. While this may sound simple in concept, it requires a radical change in thinking on the part of many organizations. All too often, organizations work more on trying to fix a department member’s weaknesses than maximizing their strengths. I highly recommend two books from Gallup Press that define this philosophy and enable you to take immediate action. 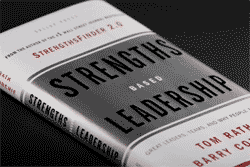 The books, Strengths Finder 2.0 and the companion title, Strengths-Based Leadership give you immediate access to assessing the strengths of each member of the admissions team and, what’s more, provide direction in managing each member of the team based on their individual strengths. 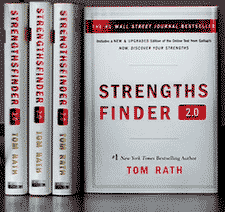 I suggest purchasing the Strengths Finder 2.0 book for every member of the team because each book contains a unique code that provides access to an online assessment that isolates and reports their top five strengths. When we work with enrollment management departments as a part of our consulting engagements, we use a similar model to enhance productivity. You would be amazed at the results achieved when people are allowed to discover and play to their strong suits. Likewise, in our Interactive Training Workshops for admissions offices, we see team members revitalized by the commitment that their leadership has made by investing in their future with professional training. 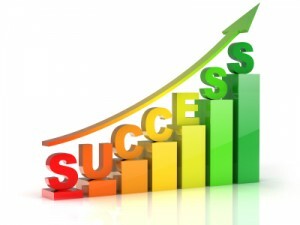 We see it work every day: hire the right people, put them in roles that let their strengths shine through, give them the proper tools, and structure their compensation to reflect the value they bring in terms of revenue generation and populating the institution with students who will be successful and committed to the institution long after graduation. Bob Longmire is the President and CEO of Longmire and Company and has been helping colleges and universities across the country maximize their yield for over 20 years.